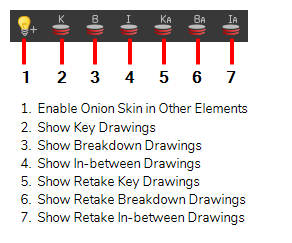 The Onion Skin toolbar displays previous and subsequent drawings. When designing or animating, it is useful to see previous drawings. By default, previous drawings appear in a shade of red and next drawings are displayed in green. In the Onion Skin toolbar, you can select the type of drawing to display. NOTE You can change the default onion skin display colours in the Preferences dialog box. For tasks related to this toolbar, see . Select Windows > Toolbars > Onion Skin. Displays previous and next drawings in other layers than the current one. In the Drawing view, use the Enable Onion Skin in Other Elements feature to see the previous and next drawings of the layers visible in Light Table mode. Displays all drawings marked as key drawings. Displays all drawings marked as breakdown drawings. Displays all drawings marked as in-between drawings. Displays all key drawings marked to be retaken. Displays all breakdown drawings marked to be retaken. Displays all in-between drawings marked to be retaken.